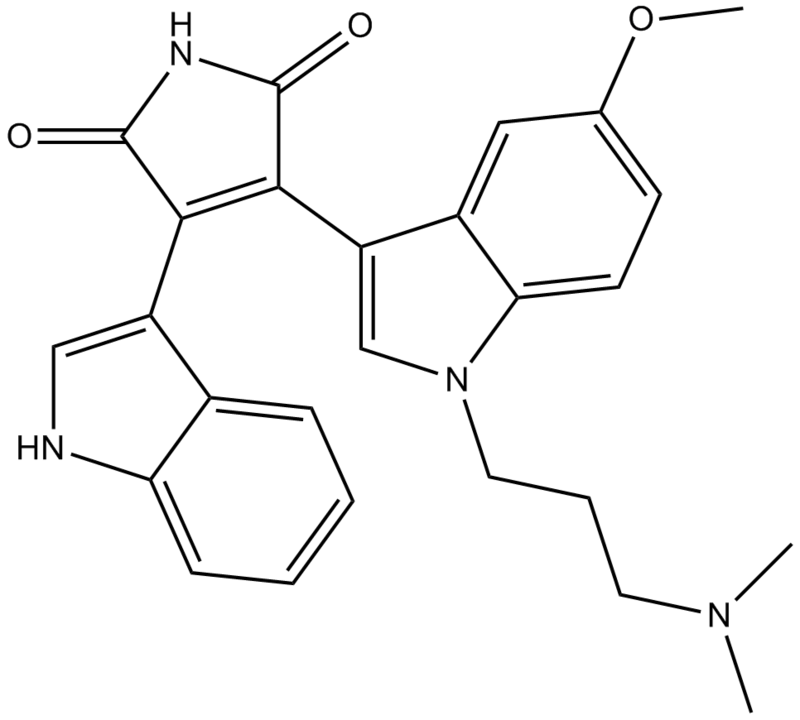 Description Go 6983 is an inhibitor of pan-PKC with IC50 values of 7 nM, 7 nM, 6 nM and 10 nM for PKCα, PKCβ, PKCγ and PKCδ, respectively. Phosphorylation reactions were carried out in a total volume of 100 μL, containing buffer C (50 mM Tris-HC1, pH 7.5, 10 mM β-mercaptoethanol), 4 mM MgCl2, 10 μg PS, 100 nM TPA, 5 μL of a Sf158 cell extract as a source of recombinant PKCμ or of Sf9 cell extracts as a source of other recombinant PKC isoenzymes, 10 μg of syntide 2 as substrate, and 35 μM ATP containing 1 μCi [γ-32P]ATP. In some experiments PS and TPA were omitted or various inhibitors at concentrations indicated in the text were added. After incubation for 10 mins at 30 °C, the reaction was terminated by transferring 50 μL of the assay mixture onto a 20-mm square piece of phosphocellulose paper, which was washed 3 times in deionized water and twice in acetone. The radioactivity on each paper was determined by liquid scintillation counting. The solubility of this compound in DMSO is >10 mM. General tips for obtaining a higher concentration: Please warm the tube at 37 °C for 10 minutes and/or shake it in the ultrasonic bath for a while. Stock solution can be stored below -20 °C for several months. 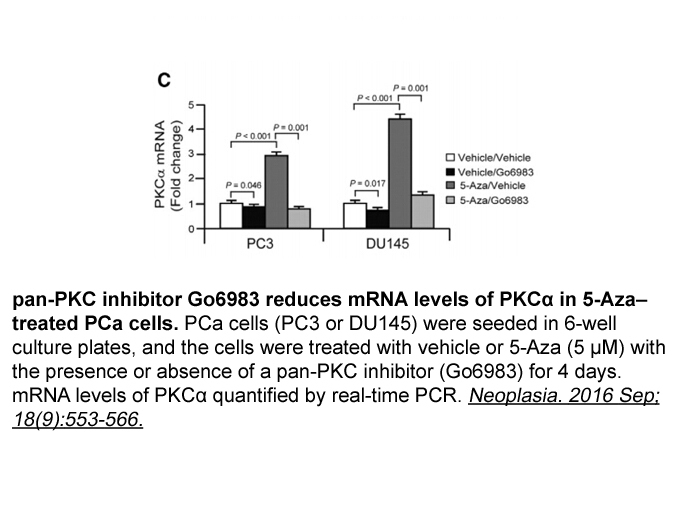 In ARCaPE cells, Go 6983 at the dose of 200 nM significantly inhibited the up-regulation of PKCs(PKCα, PKCβ and PKCγ) stimulated by the PMA treatment. In addition, Go 6983 showed complete inhibition at the dose of 1000 nM. In a mouse pulmonary B16BL6 tumor model, Go6983 at the dose of 22.0 μg/mouse significantly inhibited tumor metastasis by 51.2 %.
. Gschwendt, M., et al., Inhibition of protein kinase C mu by various inhibitors. Differentiation from protein kinase c isoenzymes. FEBS Lett, 1996. 392(2): p. 77-80.
. He, H., et al., Phorbol ester phorbol-12-myristate-13-acetate induces epithelial to mesenchymal transition in human prostate cancer ARCaPE cells. Prostate, 2010. 70(10): p. 1119-26.
. Kim HR, Lee KH, Park SJ, Kim SY, Yang YK, Tae J, Kim J. Anti-cancer activity and mechanistic features of a NK cell activating molecule. Cancer Immunol Immunother. 2009 Oct;58(10):1691-700. Go 6983 is a selective inhibitor of PKCα, PKCβ, PKCγ, PKCδ and PKCμ with IC50 value of 7 nM, 7 nM, 6 nM, 10 nM, and 20 mM, respectively . Protein kinase C (PKC) serves as the receptor for tumor-promoting phorbol esters, which are potent activators of conventional (c) and novel (n) PKCs and has several isotypes: PKCα, PKCβ, PKCγ, PKCδ, PKCη and PKCμ. PKCη is reported progressively increased in MCF-10A (non-tumorigenic breast cancer cells) and promotes breast cancer cell survival [2, 3]. Go 6983 is a potent PKC inhibitor and has a different mechanism with the reported PKC inhibitor Ro-317549. When tested with MCF-7 and T47D cells, Go 6983 showed reversible effect on the down-regulation of PKCαand PKCδ induced by PKC activator PDBu, while decreased the expression of PKCη which up-regulated by PDBu. Further, Go 6983 treatment inhibited the MCF-7 cell survival by inhibiting the expression of PKCη . In ARCcPE cells, PMA treatment promoted the EMT process by up-regulating the expression of PKCs(PKCα, PKCβand PKCγ) which could be significantly inhibited by Go6983 treatment through inhibiting PKCs expression at the dose of 200 nM and completely inhibited at the dose of 1000 nM . In chromaffin cells isolated from female mice, Go 6983 treatment before AP-stimulus protocol reconciled the basal capcacitance values, decreased the capacitance and reduced calcium current density in a PKC dependent manner. To note, these phenomenons were more obvious in female mice compared with male mice .
. Pal, D., S.P. Outram, and A. Basu, Upregulation of PKCeta by PKCepsilon and PDK1 involves two distinct mechanisms and promotes breast cancer cell survival. Biochim Biophys Acta, 2013. 1830(8): p. 4040-5.
. Chan, S.A., J. Hill, and C. Smith, Reduced calcium current density in female versus male mouse adrenal chromaffin cells in situ. Cell Calcium, 2012. 52(3-4): p. 313-20.